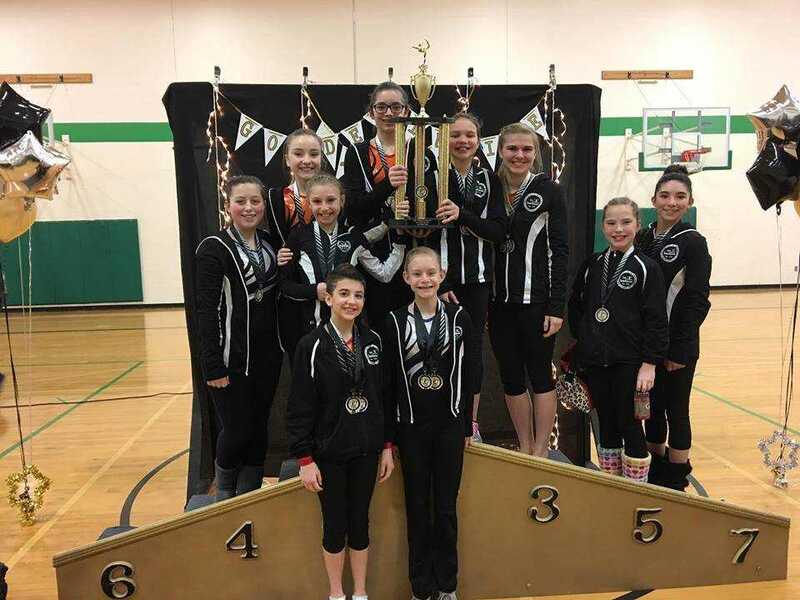 The Turnaround GK Blaze and GK Storm competitive gymnastics team blazed into their last regular meet of the 2017 competition season at the Golden Invitational in Omaha March 10-11. 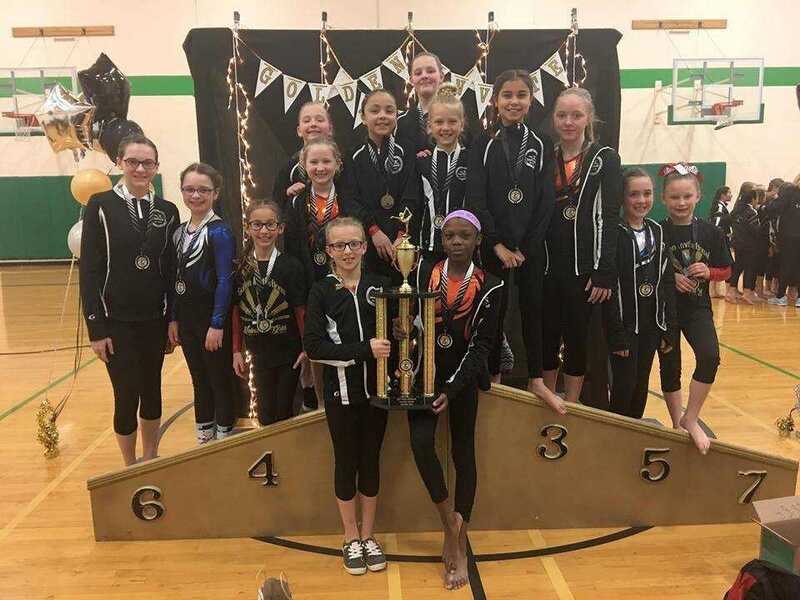 The Turnaround GK Team took 37 gymnasts that competed at four different levels, Bronze, Silver, Gold, and Platinum. 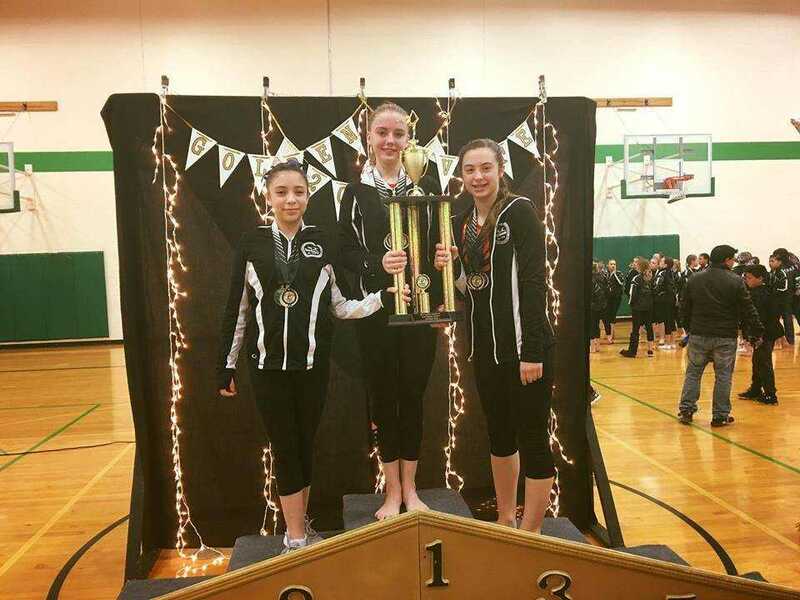 BRONZE - 1st Place Team Brylee Bengston -- Vault 8.50 (3), Bars 8.3, Beam 9.05 (1), Floor 8.55 (3), All-Around 34.40 (1st). Kenzie Niehus -- Vault 8.550 (1), Bars 8.850 (2), Beam 8.8 (2), Floor 8.10, All-Around 34.30 (2nd). Maren Dreckman -- Vault 8.0, Bars 9.0 (1), Beam 8.7, Floor 8.5 (4), All-Around 34.20 (4th). Kendra Baartman -- Vault 8.45 (4), Bars 8.450 (5), Beam 8.8 (3), Floor 8.4 (5), All-Around 34.1 (5th). Ava McCarthy -- Vault 9.50 (1), Bars 9.2 (2), Beam 9.25 (2), Floor 9.4 (1), All-Around 37.40 (1st). Hazel Simmelink -- Vault 9.1 (3), Bars 8.5 (4), Beam 9.15 (3), Floor 8.6 (3), All-Around 35.35 (3rd). Taylor Rolfes -- Vault 9.4 (1), Bars 9.0 (2), Beam 9.55 (1), Floor 9.45 (1), All-Around 37.40 (1st). Aneissa Yahola -- Vault 8.95 (3), Bars 8.6, Beam 8.9, Floor 8.45, All-Around 34.90. Josilynn Pritchard -- Vault 9.35 (1), Bars 9.0 (2), Beam 9.6 (2), Floor 9.2 (2), All-Around 37.15 (2nd). Madison Goings -- Vault 8.35, Bars 7.9, Beam 9.6 (3), Floor 8.8, All-Around 34.65. Kloie Wade-Lockwood - Vault 9.65 (1), Beam 9.0 (4), Bars 9.4 (1), Floor 9.2 (2), All-Around 37.25 (1st). Jocelyn Roder -- Vault 9.15 (1), Bars 9.1 (1), Beam 9.15 (2), Floor 9.0 (3), All-Around 36.4 (2nd). Allison Ehlers -- Vault 9.6 (1), Bars 8.7 (4), Beam 9.65 (1), Floor 9.3 (2), All-Around 37.25 (1st). Erika Scheffelman -- Vault 9.4 (3), Bars 9.1 (1), Beam 9.65 (2), Floor 9.05 (4), All-Around 37.2 (2nd). 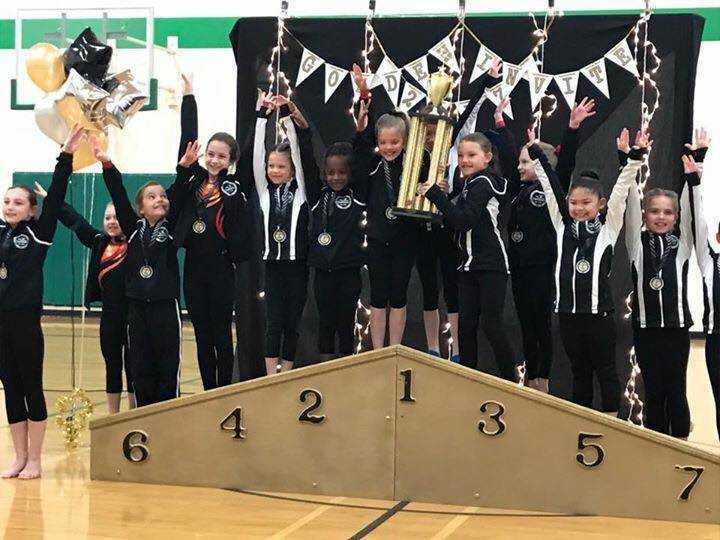 GOLD - 2nd Place Team Irelyn Ahlers -- Vault 9.125 (2), Bars 9.3 (2), Beam 8.75, Floor 9.15 (4), All-Around 36.325 (1st). Parissa Frederiksen -- Vault 8.75, Bars 8.55, Beam 7.45, Floor 8.7, All-Around 35.00. Taylor Robertson -- Vault 8.8, Bars 8.55, Beam 7.45, Floor 8.125, All-Around 32.925. Savannah Manley -- Vault 9.2 (1), Bars 9.0 (5), Beam 9.125 (2), Floor 9.375, All-Around 36.70 (1st). Alexis Barber -- Vault 8.85 (3), Bars 8.6, Beam 8.55, Floor 9.125 (3), All-Around 35.125. Ciara Barron -- Vault 9.2 (1), Bars 9.5 (1), Beam 9.3 (1), Floor 9.275 (1), All-Around 37.275 (1st). Grace Heeren -- Vault 8.175, Bars 8.9 (5), Beam 8.575, Floor 8.450, All-Around 34.10. Hailey Reimers -- Vault 8.45, Bars 8.55, Beam 8.9 (5), Floor 9.05 (3), All-Around 34.95. Jenna Laughton -- Vault 9.0 (2), Bars 9.15 (1), Beam 8.25, Floor 8.475, All-Around 34.875. Cheyenne Jackson -- Vault 7.2, Bars 7.85, Beam 7.4, Floor 9.0 (4), All-Around 31.45. PLATINUM - 3rd Place Team Venus Gonzalez -- Vault 9.0 (4), Bars 7.8, Beam 8.4, Floor 9.1 (4), All-Around 34.30. Molly Roder -- Vault 9.175 (4), Bars 8.4, Beam 9.2 (1), Floor 9.15 (3), All-Around 35.925 (2nd). Kennedy Hinrich -- Vault 9.275 (1), Bars 8.625 (2), Beam 8.3 (4), Floor 9.4 (2), All-Around 35.60 (3rd). SILVER - 2nd Place Team Ashley Johnson -- Vault 9.0 (2), Bars 9.6 (2), Beam 8.6 (5), Floor 9.0 (4), All-Around 36.2 (4th). Lexi Konz -- Vault 9.2 (1), Bars 8.9 (2), Beam 9.4 (1), Floor 8.2 (3), All-Around 35.70 (2nd). Mackenna Frerichs -- Vault 8.8 (3), Bars 9.45 (3), Beam 9.4 (4), Floor 8.55 (5), All-Around 36.2 (3rd). Peyton Small -- Vault 8.4 (5), Bars 9.5 (1), Beam 8.15 (5), Floor 8.85 ( 3) , All-Around 34.90 (5th). Makenzie DeRocher -- Vault 8.7 (2), Bars 9.35 (1), Beam 9.8 (1), Floor 9.15 (1), All-Around 37.00 (2nd). Mia Stinton -- Vault 8.7 (3), Bars 9.1 (4), Beam 8.95 (5), Floor 8.75 (3), All-Around 35.50 (3rd). Neely Bacon -- Vault 7.8, Bars 9.1 (5), Beam 9.15 (3), Floor 8.65 (4), All-Around 34.70 (4th). Isabelle Landgraf -- Vault 8.35 (4), Bars 9.3 (2), Beam 9.0 (4), Floor 7.7, All-Around 34.35 (5th). Eden Koedam -- Vault 8.65 (4), Bars 9.35 (4), Beam 9.2 (5), Floor 8.6 (4), All-Around 35.8 (4th). Ellaina Pick -- Vault 7.4 (5), Bars 8.8 (5), Beam 9.45 (3), Floor 8.55 (5), All-Around 34.20 (5th). Shayla Dreckman -- Vault 7.6 (4), Bars 9.3 (3), Beam 9.35 (3), Floor 8.4 (4), All-Around 34.65 (4). Alaina Littlegeorge -- Vault 8.45 (4), Bars 9.5 (1), Beam 9.0 (5), Floor 8.5 (5), All-Around 35.450 (5th). Jordan Staab -- Vault 8.6, Bars 9.4 (3), Beam 8.85 (4), Floor 8.9 (4), All-Around 35.65 (4). Maddie Keunen -- Vault 8.6, Bars 9.4 (3), Beam 8.65, Floor 8.0, All-Around 34.65 (6).